Promotional art for Satorl Marsh. Last week, I covered three of my favorite places in Xenoblade Chronicles. The short write-up got a great response, and there’s always more gorgeous environments to talk about in a game like this one. Without much further ado, let’s take another brief look at some of this game’s best areas. This is a post for TAY’s theme week. I avoided story spoilers, but some late-game locations are featured. Also, be warned that many of the screens in this article were likely enhanced by an emulator. Finally, I highly recommend listening to the themes for each area as you read about them. ... comes alive after the Sun goes down. And what’s a Xenoblade area without massive, ancient ruins? For many Xenoblade fans, seeing Satorl Marsh transition from day to night (music links) is one of the best moments in the game. But, for such a special occasion, it has an oddly incongruous nature. Xenoblade measures time on its own in-game schedule, and cutscenes don’t change how this works. When I walked into this area during my playthrough, it was already night. I was immediately greeted by the beautiful scenery, and the transition from night back into day was actually rather disappointing. Others walked into this area and experienced a barren swamp with one of the game’s less emotional tracks playing over it. The transition to night was a special reveal to them, something people who entered at a later hour did not get to experience in the same way. 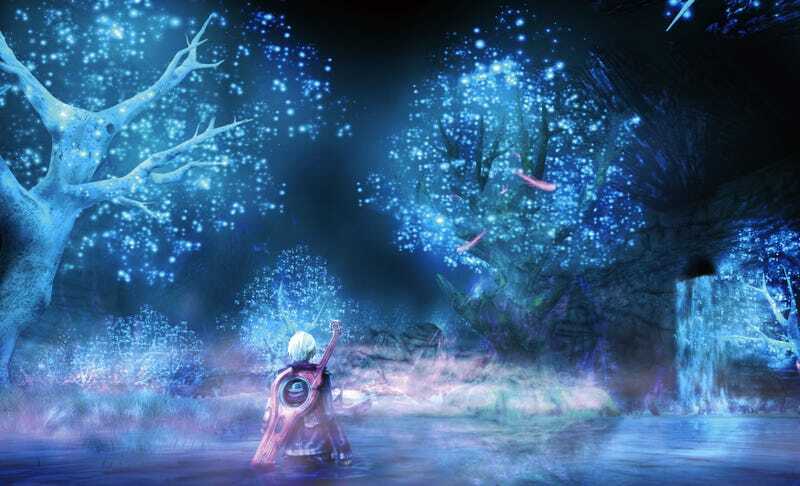 The music, especially, is very different for day and night, unlike almost all of Xenoblade’s other areas. Concept art, with the Fallen Arm getting left out of the fun. The overgrown fingers of the Mechonis. The beach featuring one of the story’s best moments. In the ancient fight between Xenoblade’s two titans, long before the game’s story begins, the Bionis slices off the arm of the Mechonis (Day theme, night theme). The Mechonis has a new arm by the time the game begins, but its first arm is smartly integrated into the game’s story. The Fallen Arm’s presence lends a legitimacy to the ancient fight, a physical artifact solidifying a legendary tale. The Fallen Arm is also the scene of one of the story’s highlights (big spoilers). It’s an affirmation of a big twist and a somewhat unexpected romantic moment. Perhaps the best thing about the Fallen Arm is its little, hidden village. The music here strikes a balance between the Fallen Arm’s forgotten, lonely vibe and the overarching story’s acceleration towards war. The villagers are preparing to leave a long hiding to fight for the greater good of the world. Throughout much of Xenoblade, the player is at odds with the Mechonis. It’s the source of robots that kill people and destroy villages. The hidden village asks the player to reconsider this stance, by showing them that not all that comes from the Mechonis is evil. I’ll avoid going into detail to avoid spoiling this section, but it’s an instance of something the game does well. Xenoblade likes to present the player with a clear enemy, then force them to rethink their assumptions. The player’s experience in the hidden village is just one such instance. An overhead view of the city that crowns the Mechonis. A massive shrine is Agniratha’s defining feature. A residential district, featuring the remains of an ancient monster. Agniratha is not one of Xenoblade’s best-loved locales, and I apologize for being unable to find higher-quality images (Day theme, night theme). It comes extremely late in the game, and many of the players that take in the beautiful sights of the Bionis (the game’s nature titan) never get to see what the Mechonis has to offer. The beauty of Agniratha and the Mechonis’ other locales is also very different from what is featured in the earlier parts of the game. The art here is all of a distinctly mechanical flavor, and it took me a long time to find it beautiful. Despite all this, it’s a special location in a game full of them. One of the best parts of RPGs is traveling to new cities and interacting with the locals. That’s why I was initially disappointed to find Agniratha devoid of residents, due to a long-ago battle whose scars remain. But, as I played through the city, my initial disappointment gave way to a greater sense of wonder. This empty city has a lot to offer, and there’s a feel to it that reminds me of Zelda: Breath of the Wild. The overview (ancient battle, vast destruction) is given, but the details are left to the player. Agniratha is filled with abandoned apartments and forgotten shrines. What might they have been like when the city was thriving? The music, as in so much of Xenoblade, longs for a forgotten time of prosperity. The city is open to the sky, and its high vantage allows the player to look from the Mechonis back at the Bionis, opposite the views in the beginning of the game. At this point, the player’s understanding of the game’s world has changed, and is about to change more, making this flip symbolically and visually striking. Agniratha doesn’t offer any of the stunning natural features Xenoblade is known for, but it’s one of the places I think about most. As I’ve mentioned, it’s hard to boil down Xenoblade to just a few places. Some great locations got left off the list, and I may revisit that in the future. The three places listed do some of what Xenoblade is best at. They are stunning, thought-provoking, and unlike anything else in games. Can a Game Be Too Personal?